Regulators late today approved plans to develop and test the futuristic air taxis. The flying taxi during testing. 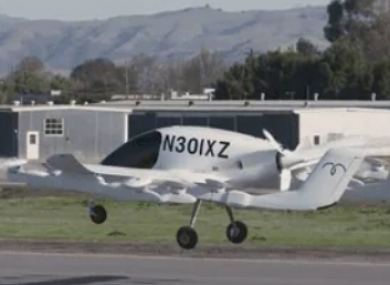 PILOTLESS FLYING TAXIS are being tested in New Zealand as part of a project backed by Google co-founder Larry Page that supporters say will revolutionise personal transport. New Zealand regulators late today approved plans for Zephyr Airworks, a subsidiary of Page’s company Kitty Hawk, to develop and test the futuristic air taxis. “We are offering a pollution free, emission free vehicle that flies dependably, we think this is the logical next step in the evolution of transportation,” Zephyr chief executive Fred Reid said. The Cora prototype being tested in New Zealand’s South Island uses three on-board computers to calculate its flight path and is capable of carrying two passengers. The Cora project envisages the air taxis becoming so common that “air travel will be woven into our daily lives”. “You wouldn’t have to know anything about flying a plane. Cora could fly for you,” it said in a promotional video. And it would be all-electric, helping to build a sustainable world. Cora appears far more robust, with a design more like a traditional aircraft featuring wings, a tail and a closed canopy for passengers. Zephyr said Cora took eight years to design but then developers needed a suitable environment to safely test the new technology. “We had no idea what to expect,” he said. They could have laughed us out of the room. We were pitching something that sounded like science fiction. “This aircraft represents the evolution of the transport eco system to one that responds to a global challenge around traffic and congestion, and is kinder to the planet,” Christchurch mayor Lianne Dalziel said. Email “Pilotless flying taxis are being developed and trialled in New Zealand”. Feedback on “Pilotless flying taxis are being developed and trialled in New Zealand”.